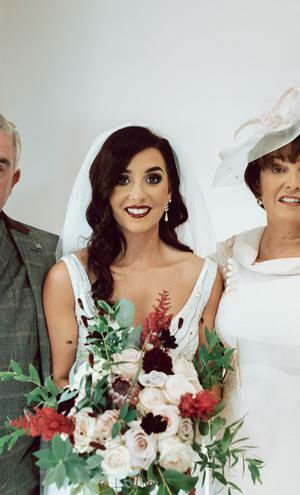 Marie-Claire McNally (née McGurk) and Dean McNally from Kildress, Co. Tyrone, first met at a Halloween disco at the Greenvale Hotel eight years ago. 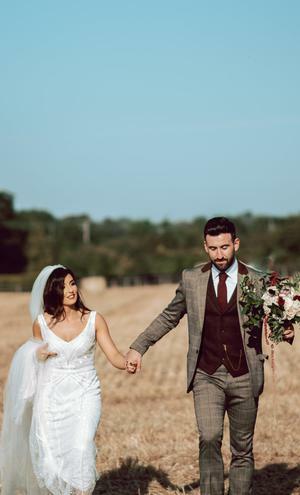 Dean popped the question on top of the Slieve Donard Mountain, Co. Down - the first mountain the couple ever hiked together and one they take on annually with their two gorgeous dogs - in the summer of '17: "It's one of our favourite places," says Marie-Claire. 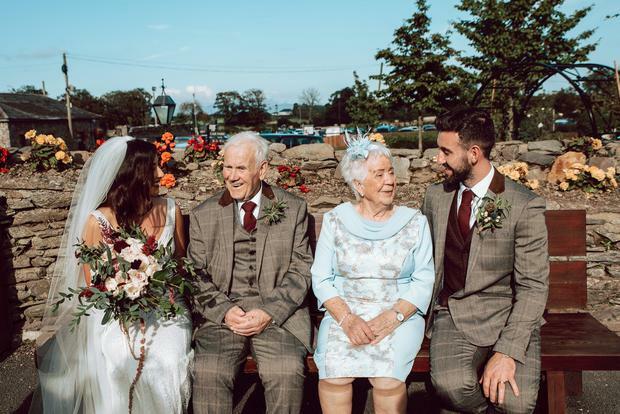 The couple spent just over a year planning their big day, wanting to create a celebration that was a 'true relection' of all the things they loved. "We also wanted to throw a party for our friends and family to remember for years to follow!" says the bride. 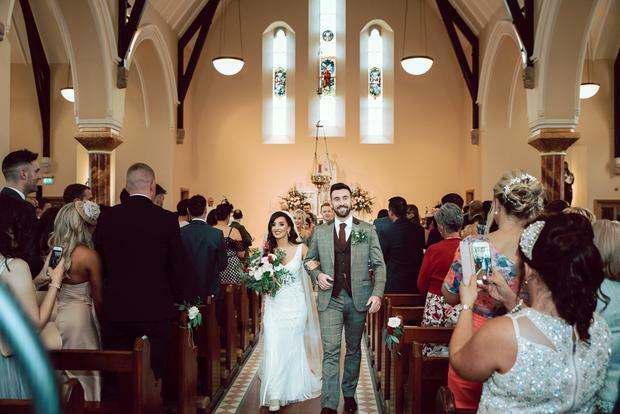 They tied the knot on the 1st September in St. Mary’s Chapel Dunamore, Kildress, with Fr. Patrick Hughes as their celebrant. 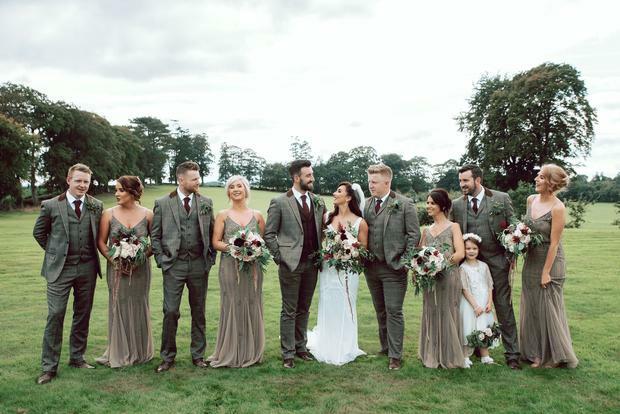 After the ceremony, the newlyweds and their guests headed to Darver Castle, Co. Louth, for an evening of fabulous food and plenty of dancing. For Marie-Claire, one of the most memorable moments was their mini photoshoot in a field beside the castle where they got to relax and spend some time having fun by themselves. 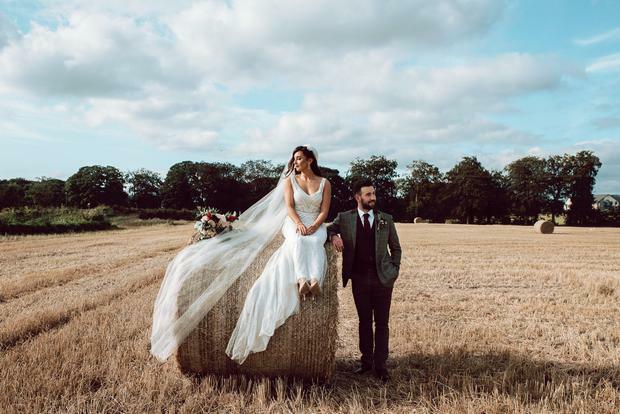 "Dean also lifted me onto a bale of straw which made me very happy," says the bride. "I loved this part of the day... The sun was shining bright... it’s the simple things." Their photos are by Gemma Gilfilllan of Gemma G Photography. 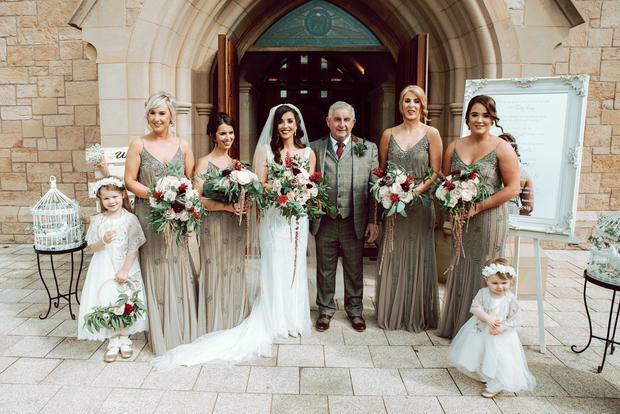 Marie-Claire's Eliza Jane Howell gown was purchased in Creative Ideas Bridal Cookstown, Co. Tyrone. Shopping for the dress, she says, had its highs and lows, and while she enjoyed the time spent with her mother, mother-in-law and bridesmaids there were a few days of frustration when she thought she would never find the dress she wanted - "But I ended up finding my dream wedding dress in a bridal boutique ten minutes from where I live! It was all perfect and meant to be." 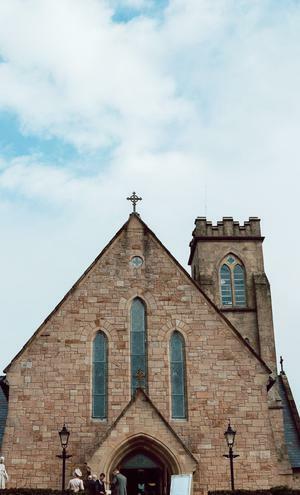 The couple planned a rustic, vintage-themed wedding featuring beautiful wooden decor by Omagh company Wooden Treats throughout the chapel and later, the castle. 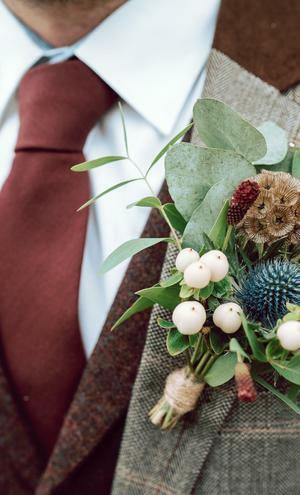 "Their décor is all handmade and had a true rustic look," Marie-Claire explains, "we also got them to design a unique Memory Frame for us to hang photos of loved ones that have passed away." 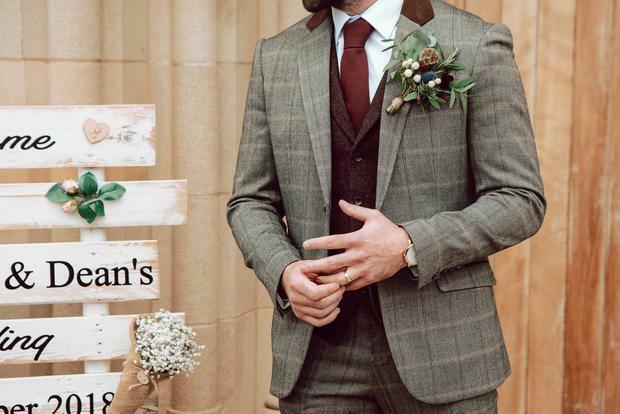 "I always knew I wanted a brown suit and just happened to find a suit I loved the first day we went suit shopping," says groom Dean who wore a autumnal-feel check Cavani suit from Tux & Tails Dungannon, Co. Tyrone for the day. 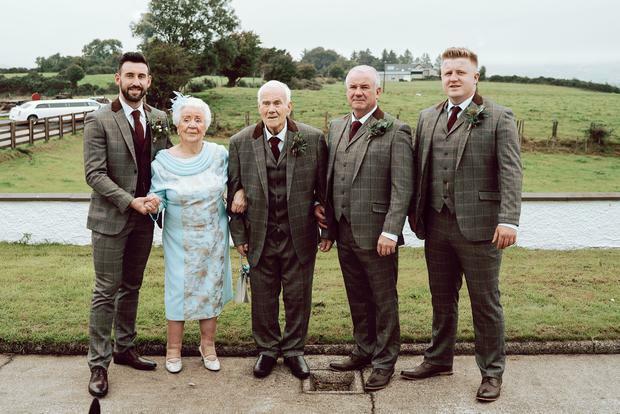 "Getting the perfect tie to match in however proved to be more stressful than expected!" he adds. 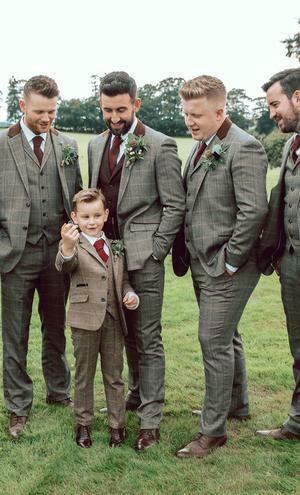 To differentiate himself from the groomsmen, who wore matching waistcoats with their suits, Dean opted for a dark brown tweed waistcoat designed by Dee Graham Tailor Made, which complemented his deep burgundy tie (and the bride's stunning dark lip!) perfectly. 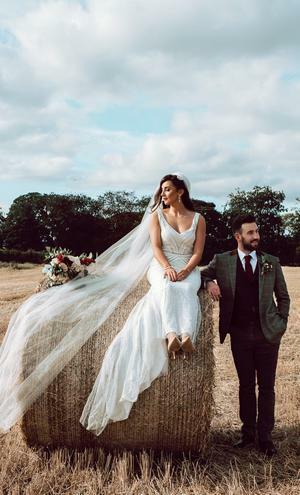 "We always wanted a quirky and unique venue with nice outdoor scenery and Darver Castle was definitely that," says Marie-Claire. It is such a beautiful place inside and out, and the staff are fantastic and made us feel at home from the very first day. 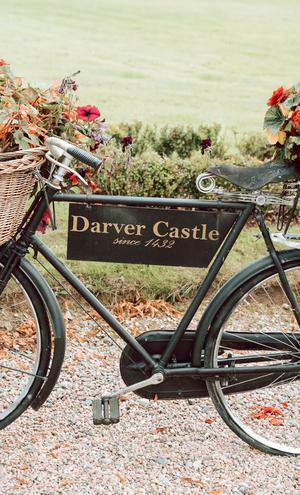 When we first arrived at Darver Castle we didn’t have an appointment made. Anne, the wedding coordinator, took us in for a quick chat... we knew straight away it was the perfect venue, it was everything we wanted. Their choice of food for the menu was amazing too. There was so much to choose from we were spoilt for choice. For our guests arriving to the castle, there were homemade sausage rolls, scones, jam and cream, and sandwiches served with tea and coffee." For the drinks reception, guests were treated to flutes of Guinness and Champagne while the evening buffet included sumptuous mini gourmet burgers and bacon butties. 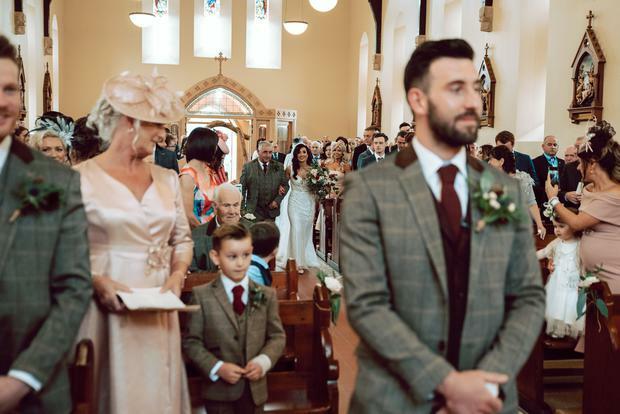 "We honestly couldn’t pick a particular part of the day," says Marie-Claire, "we loved it from start to finish, it was everything we had ever hoped and wished for. The volinist was one of the highlights of the day, she played in between our main course and dessert, she really set a lively tone for the evening to follow." If they could have done anything differently, Marie-Claire says the would have had the guest list and table plan finalised sooner: "Doing the table plan a few days before your wedding is not ideal." Dean advises couples to take a few days off from work ahead of the wedding. He took two days holiday however for him, two days wasn't "quite enough" to get everything done on-time for the day. 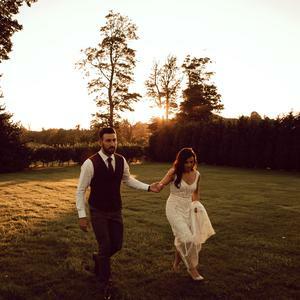 "Do not stress or get too worried," says the bride, "before you know it your day will have passed." Marie-Claire also points out that couples who have shorter engagements may have less time to save - which can mean compromising on certain things. "Don’t ask too many people for advice because sometimes you will get answers that you don’t really want to hear!" she adds. 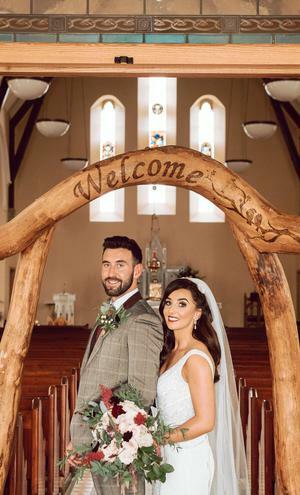 Both Dean and Marie-Claire recommend a 'delayed honeymoon': "We had a mini moon in the South of Ireland and went to a few different places; Wicklow, Kilkenny, Kinsale and Dublin, which gave us time to chill before going back to work." They are going to South Africa and Mauritius in early 2019.